This Museum quality set of Matryoshka nesting dolls amazes the viewer with the lavishness of colors and the singularity of design. 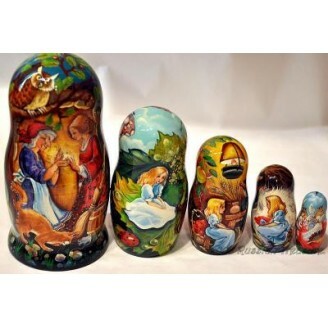 The images conveyed by each Matryoshka nesting doll will presently conjure up the plot of the most famous and fancied fairy tales – Thumbelina. Originally written by the famous Danish poet and author Hans Christian Andersen, it was translated into many languages and became very popular among the Russian audience under the name "Dyuimovochka". The most striking feature of this set of Matryoshka nesting dolls is the continuity of the theme, achieved by the author by carefully wrapping each illustration around the Matryoshka nesting dolls, blending each scene into one another without any visible break in the action of the story. Dreamlike events reproduced in each Matryoshka nesting doll along with the illusive colors attest to the artist's unequalled skill to transfer the viewer into the fabulous world of fantasy and fairy tales. The color palette is so rich that it virtually impossible to believe that each Matryoshka nesting doll has been handcrafted and hand painted. But the most magnetizing effect is achieved by the absence of the usual girl's face which is considered an intrinsic part of every Matryoshka nesting doll. An exceptional piece of Russian handicraft, this set of Matryoshka nesting dolls will make a most precious pearl in any collection and will bring tons of joy to children when presented as a gift on Christmas, Easter, or Birthday. Signed by the artist, this fairy masterpiece is personally selected from the artists that we have worked with for many years.